supposedly who lives in Ontario. Did that interior come like that from the factory with all that suede and the sparco's?? They are Recaro (designed seats) exclusivey made for the EVO III M3. Incredibly Nice, Does Anyone Know How much it Sold for also? Do the EVO's have more power than the regular M3's! EVO I had a 2.3L engine producing 200 HP. EVO II had a 2.3L engine producing 220 HP. EVO III had a 2.5L engine producing 238 HP. last email i got from the owner. 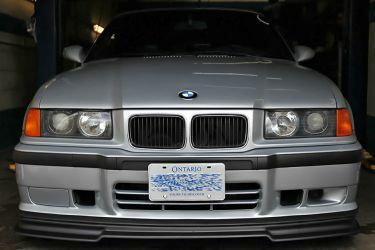 yup the Evo pretty much makes my e30 m3 a piece of junk (never thought I ever say that... but its true I guess). Just noticed something.... Why would the car have European Plates. Was it just shipped in when it was sold? Picture was obviously taken in Europe? Now I'm confused... the guy sells a car for 50,000 Canadian and does not bother to take more recent pictures? I emailed Benny Dhooge about 1.5 years ago. He said Will bought the car, and imported it into Canada. So i emailed Will and he said the car is in Ontario, but the owner wants to remain anonymous.